Through an analysis of your body’s reflexes, we help you to determine the exact nutrients you need to supplement your diet, in order to bring about balance and better health. We make these highly concentrated therapeutic formulations available to you in tablets, capsules, or in powdered form to “supplement” your current diet. That’s why they are called “food supplements”. How are these products produced? One example of a designed clinical nutrition supplement that we use is called “Catalyn”. 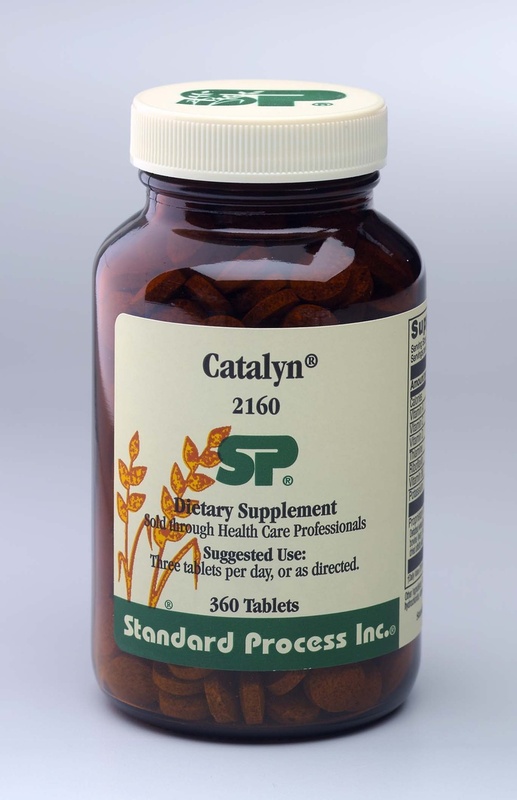 This product is produced by starting with a wide variety of carefully chosen organically grown vegetables, taking the water and fiber out using a vacuum, low heat process – without heating or cooking the vegetables, and then utilizing the concentrated food to make a bottle of Standard Process Catalyn Tablets. A. Standard Process nutrients are derived from plants grown on their own farms, in soil free of pesticides – and no chemicals are ever used. Ph.D.’s check the soil before the seeds are sown, to make sure of the fertility of the soil – and even the weeding is done by hand. B. The machinery involved in the processing of these products is made of glass and stainless steel only. C. The temperature used in processing harvested plants is never raised above the point of 90 degrees Fahrenheit, so that the active ingredients are not cooked; they remain active and alive, and have a very long shelf life. Your vitality and energy is derived from live food. Most foods today are all dead – or are not really foods at all – as in boxed cereals, canned vegetables, soda pop, etc. You can readily understand the difference between dead, devitalized pseudo-foods, with the synthetic or isolated vitamins on the one hand, and “Designed Clinical Nutrition” and a diet of real foods, on the other. There is a great deal of technology and know-how behind what we do. Having been designed through decades of clinical use on tens of thousands of patients, and on clients from many different types of health care practitioners, you can be assured that Nutrition Response Testing is capable of evaluating and solving your health concerns. A complete Nutrition Response Testing analysis can be done on each client on each subsequent visit, thereby revealing the next layers of dysfunction so these can also be addressed and corrected. In this way, each client gets a completely individualized handling, in the correct sequence for his or her body. Very much like opening a combination lock, you must use the right numbers in the right sequence and in the right direction at the right time – then the lock falls open. By following the correct sequence as revealed through Nutrition Response Testing, you don’t “shot-gun” your diet or supplements. With a correctly done Nutrition Response Testing analysis, we can determine the correct food supplements for you – designed to give your body the best possible chance of getting well and staying that way.